URI summer classes: Should I stay or should I go? For students who have the time to work on more than their tans this summer, taking summer classes presents many opportunities for advancing a degree. Â Though it may not be the best choice for everyone, the option of summer classes allows students who are behind or wish to get ahead the ability to do so. Throughout the years, however, the questions summer courses pose towards us have become less about whether or not students should take them, to where to take them. 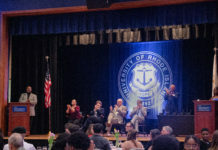 Â Students planning to take summer courses at the University of Rhode Island can expect to pay Â $225 per credit hour for instate, and $408 per credit hour for out-of-state. Â Although these prices are significantly lower than fall and spring tuition rates, there are other cheaper options available to instate students such as the Community College of Rhode Island. Money certainly speak volumes to students when they are choosing where to take summer classes, especially when the only financial aid they can expect is the aid they may have left over from the previous fall and spring semesters. With the lowered summer rates, this is less of an issue for most, but there are several others factors and concerns that should be considered when deciding where to study for the summer. Often overlooked by summer students are the effects that summer courses will have on GPA. Â Though the GPA scale during summer sessions is not different than normal term, receiving and A in any class at any other institution will do nothing for your GPA, because only credits transfer, not grades. Â This may be frustrating for students to learn after acing a difficult subject somewhere else, so if your goal of taking summer courses is to boost your GPA, you can only accomplish this at URI. Â Then again, if you think you’ll be lucky to pass chemistry anywhere, it might be in your best interest to go somewhere else. Location is also a big deal in the decision of where to study. Some students prefer to be by the beach, while others just choose the easiest destination. Â Student Nicole Labbe said she takes classes at URI mainly because of its convenient location from her home. Â Other students who don’t have this convenience can still have options for taking summer session classes. Â Limited and competitive housing is available, but online courses may be a better fit for some. Â “You now take URI home with you, you don’t necessarily have to stay here,” Steve Cooper, coordinator of Summer Sessions marketing, said. Some students may be worried about taking summer classes because they believe they will not learning the same amount of course material as students taking the same courses during a normal term. Â They can rest assure, however, that they are not at any kind of disadvantage. Â Research from the university confirms that, Â “The learning outcomes, the goals for students are the exact same in five weeks doing it for longer class sessions, as they are for fall and spring semester,” Olerio said. Three summer sessions at URI will be offered this year. Session one will be held from May 18 to June 19, session two June 22 Â to Aug. 24, and session three from May 18 to Aug. 24.